Canary Islands resorts are some of the great luxurious and best reviewed resorts in Europe. We've listed the best of the best below starting with a quick overview of the Canary Islands. The Canary islands are well known for their warm dry weather. July and August are pretty hot. There are two high seasons one in winter and one in Summer when the Spanish take their break. You can higher into the mountain resorts of Gran Canaria for cooler weather year round. For less crowds and reduced tariffs the Autumn is a good time. The Canary Islands are located in what was recently a poorer area of 600 km off the coast of Spain and within 100 km of the African mainland. As a result there are some sustainability issues when it comes to supporting a comprehensive tourism industry. Water is a precious resource here and some resorts will work hard not to waste it. While the Canary Islands are sometimes stigmatized as a bit trite like the boldly colored buildings, behind the veneer is a destination rich in character and diversity. Brilliant villages, wonderful resorts and some outstanding beaches, with beachside cocktail bars, and year round sunny warm weather are an everyday part of life. Lanzarote is one of the most scenic spots in the Canary Islands and is further to the east. For beaches seek out a hotel or resort near Puerto del Carmen or Playa Blanca. This is also an extremely active volcanic region. H10 Timanfaya Palace Adults Only Area is our top honeymoon resort or for romantics looking for an classier upscale all inclusive experience. The resort has brilliant beachside whirlpools, pools and a fer over the top gourmet restaurants. The quality of the main Mediterranean buffet and professional quality entertainment options set it aside from some of the busier all inclusive resort in the area. 305 rooms. 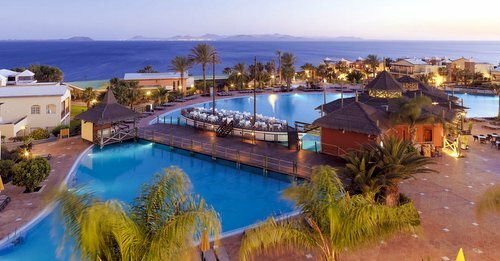 The H10 Rubicon Palace main resort is a massive Canary Islands all inclusive resort with nearly 600 rooms. Restaurants include 2 huge buffet restaurants and a wide assortment of al la carte offerings. With the size come a full scale entertainment line up and kids clubs. For Kids: Daisy Adventure pirate ship and fun water games and five pools. For Adults: Access to Despacio Thalasso Centre and personalised service. This can all seem great for busy families with diverse interests looking for a casual upscale vacation as the food and entertainment options are wide ranging but if you are on honeymoon you may like to opt for the H10 Timanfaya Palace for couples or spend a lot of time at the spa. The biggest island is Tenerife, and the high peaks of active volcano Mt. Teide, often has snow on it and is fringed by sandy tropical beaches and lush foliage. Tenerife, in the Atlantic which has a year round 20ºC to 28ºC temperature variation. 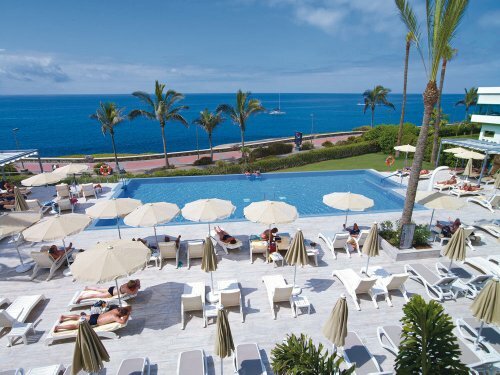 The 5 star Bahia del Duque Tenerife is located beachside on one of Tenerife's most gorgeous spots. The newly renovated Hotel and Thalasso Spa sits neatly on a hilly slope on the prime golden Playa del Duque in Costa Adeje. The 40 villas are amazing with huge rooms and private pools. Around the high end classy resort and dense green gardens, you will find extensive free form pool areas, pilates, yoga restaurants of European and Asian descents. Expect an equally huge array of wine, drinks and juice bars scattered throughout. Kids and Teens are not forgotten either with respective clubs and amenities. 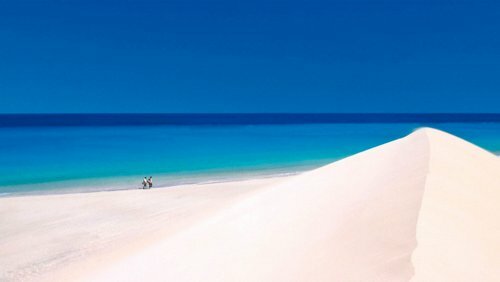 After Tenerife, Fuerteventura is the next biggest of the Canary Islands and hods claim to also having the best beaches. The Island also has it's share of pretty villages, great seafood restaurants, sun, and great resorts. The island has more than enough restorative natural places to visit as well. See the top Fuerteventura Resorts on TripAdvisor. Gran Hotel Atlantis Bahia on Fuerteventura sits majestically bn the clear blue seas and among the dunes of the Corralejo Natural Dune Park. The 5-star resort complete with Turkish steam bath, and views of Lobos and Lanzarote, is in a stunning location but close enough to restaurants in the area as not to seem isolated. Or dine onsite at the stylish La Cúpula de Carles Gaig. Family friendly additions include a kids pool and a well managed childrens club. 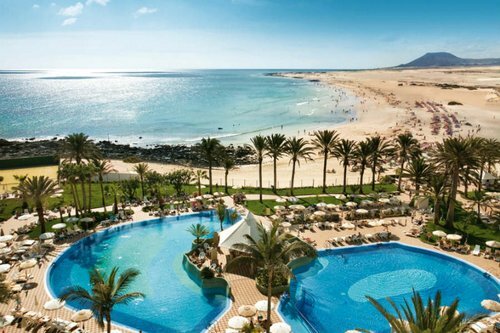 More on Gran Hotel Atlantis Bahia and other great Fuerteventura Resorts and Hotels. Hotel Riu Palace Tres Islas on the North sand dunes shore of Fuerteventura Playa de Corralejo beach is something special and our top All Inclusive Beach Resort on the island. If it's a Canary Islands beach vacation you are seeking than you wont do much better than this. A full “Renova Spa” . A huge buffet restaurant as well as some more specialised options. On the beach in Caleta de Fuste near a golf course. With a restaurant, bars including a swim-up bar, this 4 star property with has a concierge desk, a children's club and 346 guestrooms. Reviews are good. For some of the untouched beaches and night activities head to Gran Canaria has pristine beaches and an active nightlife. Built in 2000, this boutique hotel is located in the Canary Islands. It's steps from the famous beach and dunes of Maspalomas. The 94 rooms are located in one of the 7 two-story villas. The spa is set in the middle of a thousand year old palm grove and offers a large variety of treatments. You'll also find a freshwater pool, sun terrace, restaurant serving Canary Island specialties and international cuisine, a fitness area, heated salt water pool, 6 golf courses in the area and lots of trip and outings in the area. Reviewers rate this resort as a great place for older travelers and for a great honeymoon. The staff are said to be efficient and friendly, the bus station is 200m from the hotel and it has many (many) return visitors. Get more information and see the latest reviews for Seaside Grand Hotel Residencia. See all of our favourite Tenerife resorts. 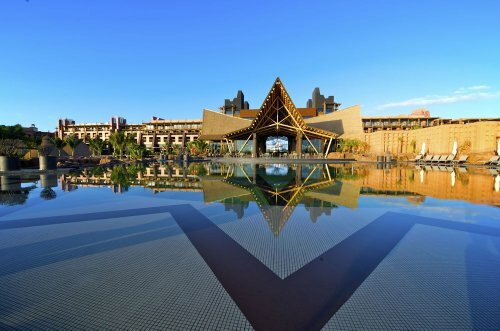 Lopesan Baobob is a 5 star, luxury resort in Tirajana, Gran Canaria. It's large with nearly 700 guest rooms and 6 meeting rooms. Highlights include the pool and lazy river, breakfast, fitness center, and much more. Reviewers give this resort great scores noting how clean it is, the great location and great food at the restaurants. Get more information and see the latest reviews for Lopesan Baobob. 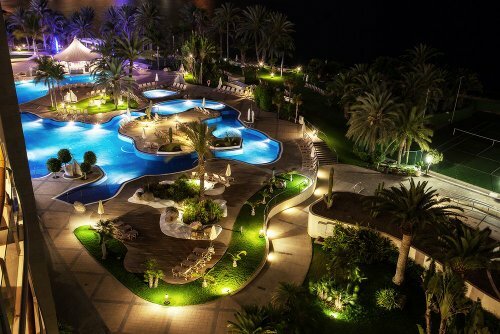 Lopesan Costa Meloneras is an excellent 4 star resort in in Meloneras, Gran Canaria. It is HUGE which means there is a lot of offer. It has over 1100 guest rooms and suites, a casino, full-service spa, large outdoor pool, nightclub, rooftop terrace, health club and more. Reviews are excellent as well with past guests loving the staff, saying the resort is like a small town, it's very clean and guests like to return which is always a great sign. Get more information and see the latest reviews for Lopesan Costa Meloneras Resort. 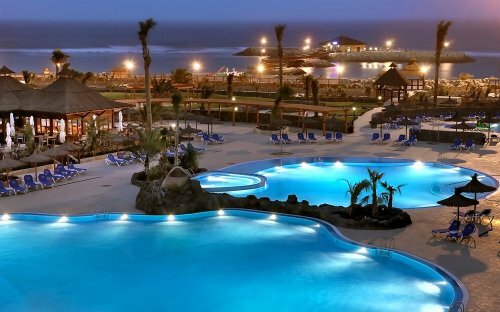 Sheraton Gran Canaria is an excellent 5 star resort with a lot to offer. It's got a golf course, 5 restaurants, poolside bars, full-service spa, 7 pools, a free children's club, free shuttle, 7 meeting rooms and more. Reviews are excellent with reviewers loving the friendly staff, the amazing food, children get a special welcome and it's a beautiful property. 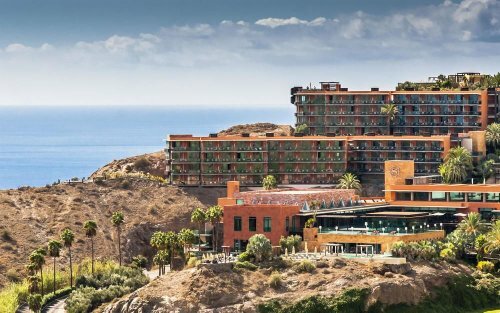 Get more information and see the latest reviews for Sheraton Gran Canaria Salobre. Another of the fine 5 star Lopesan resorts. It's mid-size with 561 rooms, full-service spa, indoor and outdoor pools, health club, airport shuttle and close to the Meloneras Beach. Reviews are excellent with many saying it's a great overall resort. 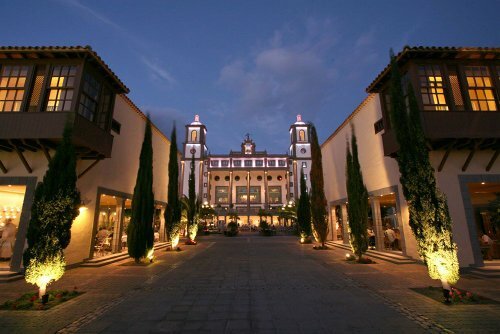 Get more information and see the latest reviews for Villa del Conde Resort. Radisson Blu Resort is 5 star and in Patalavaca, close to at least 3 great beaches. It's on the smaller side with under 200 guestrooms, close to the beach, has 2 restaurants, a full-service spa, 2 outdoor pools, and a kid's club. Reviews are excellent with great comments covering just about everything. Get more information and see the latest reviews for Radisson Blu Resort. Hotel Riu Palace is a 5 star resort is in Meloneras. 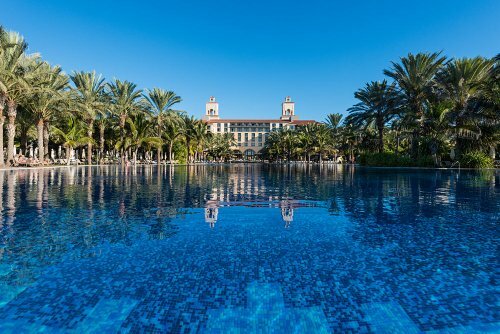 It's pretty big with 515 rooms, 3 restaurants, a full-service spa, 5 pools, 2 tennis courts, and a free buffet breakfast. Reviews are great with past guests saying it's absolutely a 5 star resort and even gives a bit extra. It has a beautiful garden and the buffet is great. Get more information and see the latest reviews for Hotel Riu Palace Meloneras. 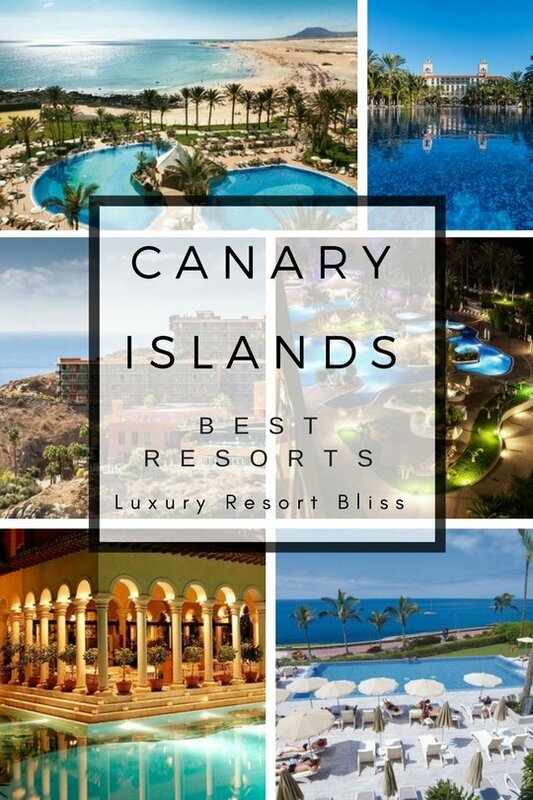 We hope you've found one of the Canary Islands resorts to suit you!